It was labeled "heinous owl with glass eyes." I heard whispers of "poisoned Doritos" and "is there enough room in the freezer for the head too?" ...it was the owls. Damn owls. ...or the cats. Damn cats. ...or I drunkenly tripped and fell into my weekly "tapoica baptismal." But my money's on the owls. I'll admit that I did jump back a tad but whoooo loves the lttle guy? I do. He looks good with the other hooters. My screen keeps jumping! Weird! Oh sweet baby jebus, I think they used real persons eyes on that! Creepy!! Yeah, I've been stalked by owls. AHH! At first i thought it was an oversized cocktail ring and i was not happy with your decision. Now that I know it's a trinket, I like it. I know art and THAT is art! Which reminds me, I just happened to spot your birthday present the other day. I think it'll be a nice addition to Casa VonPartypants. I was thinking the same thing as S.D. Those peepers look real! 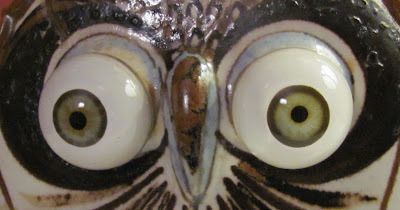 That glass eyed owl does look a bit sinister. I'd go to sleep with a shotgun, just to be on the safe side. It's wall-eyed! Has Gwen met it yet? That is literally the coolest owl I've seen. The eyes follow you everywhere. As a birder, I can tell you that if I ever saw something that looked like that out in the field, I'd break my binoculars and stab my eyes out with the pieces. It does freak me out a bit but I also am oddly drawn to those eyes. Wow. I think he looks pretty cool up there. Hoo! Hoo! I sent a little blog love to you today. My money’s on April 4th … the day you smash that creepy thing to pieces. Things the rest of us learned in third grade.